ECR stands for Expert Consensus Ranking and is the aggregated average ranking across all experts who submit their rankings to FantasyPros.com. 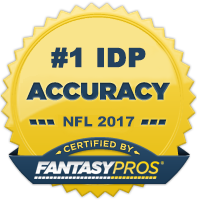 Clicking on a specific player will allow you to view the specific rankings of all other IDP experts and how those compare to my own. Additionally, you have the ability to view recent news and notes on that specific player.